This is a great blog and useful guide for eating on a budget! I came across this blog and thought this piece of advice was useful. Thought I’d pass it along to all of you. I decided it might be useful to have this list right on the blog, so here it is. Keep in mind there is lots of room for variety and flexibility. The most important thing is to have what you need (more or less) to prepare whole meals at home. Rice, Millet, Quinoa, Oats, Barley, Wheatberries etc. As we settled into our Passover Seder last night, I felt a strange confusion….I love this holiday, the ritual and order of story and blessing, all wrapped within the emergence of springtime, symbolized by special foods representing the struggle and bitterness of a complex past, the sweetness and comfort of freedom, and the rebirth that is a new season. But wait, that’s the confusing part. It just doesn’t quite feel like spring. There is still a chill in the air deterring any buds from even considering emerging, and any farmers from planting. While I know it will come, I am READY I say. Just as we denounce injustice in our Seder by saying ‘dayanu’-it would have been enough, I say ‘dayanu’ I AM READY FOR SPRING. 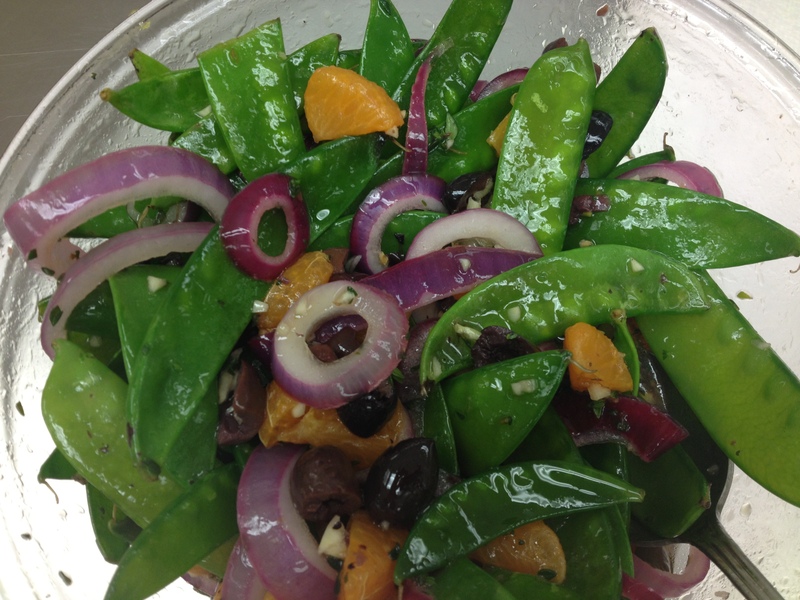 In honor of this, I assigned this simple, fresh, crispy and spring-y salad to my students tonight. The recipe calls for asparagus, but we used snow peas with excellent results! Despite the coolness outside, our spirits were brightened as we crunched on this! The combination of lemon and orange with the Mediterranean olives is fantastic. The strong flavors meet together, and enhance the freshness and spring feeling of this marinade. Add the slightly bitter, melt-in-your-mouth tenderness of fresh (and fleeting) local asparagus and it is a unique, tangy taste of the season. The Family Kitchen: In addition to breaking the asparagus just right, kids can help peel and chop the citrus, and squeeze the juice. They will enjoy the sweet and tangy smell and the sticky juice on their hands, especially if they can lick it off. Cut the asparagus into thirds and set aside. Prepare the marinade by combining the lemon juice, honey, ¼ cup olive oil, vinegar, salt, garlic and thyme and whisk well. Add oranges and juice, and olives, mix and set aside. In saucepan, heat water and 2 tablespoons olive oil. When almost boiling, place asparagus and red onion in pan, cover and steam until asparagus is bright green and tender–about 2 to 3 minutes. When ready, remove onions and asparagus from pan and cover with marinade. Chill for up to 4 hours.